I think you will be very happy. 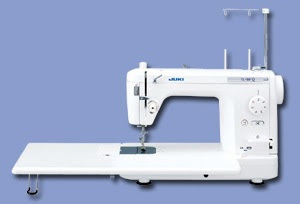 I have a Juki TL-98E and have had it at least 10 years. It's never been serviced and sews like a dream. I also have a Pfaff for my "fancy" sewing. I love both of them! Wow!! Who sells Juki around here? Enjoy the new machine -- the extra throat space should be really nice. I didn't know that Sharon Schambers quilted on a domestic machine -- I though she did all of hers on the longarm.